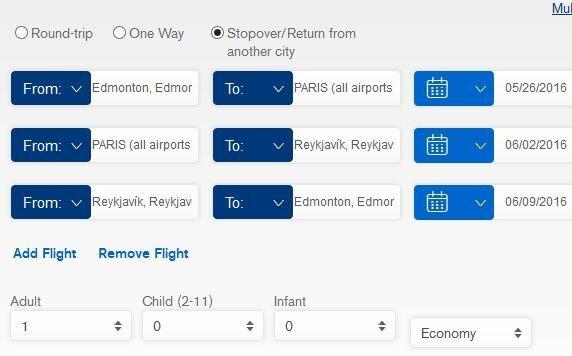 Icelandair is showing some incredibly cheap flights from Edmonton to Paris, France in June 2016 for $538 CAD roundtrip including taxes. Update: These are also showing up on FlightHub.com for $560 CAD roundtrip including taxes. Note: Use the code PAR, to search both Paris airports at once. NOTE: Certain dates involve longer layovers in Iceland. Other dates have just a 1 hour layover in Iceland. If you find a date with a long layover, you may want to try the previous date or the next date. 4. The price should come up as 275 GBP when booking through GoToGate. Click through to GoToGate to book. This price is in British Pounds. Based on today's exchange rate, and adding the 2.5% foreign exchange fee that credit cards charge, it will work out to $538 CAD that you are charged. 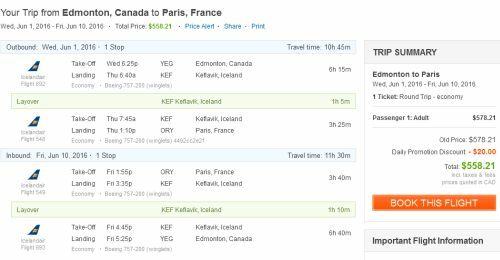 Or, you can fly from Edmonton to Paris (spend time there), and then fly to Iceland (spend time there) and fly home to Edmonton - all for just $575 CAD including taxes. You also get 2 free checked bags for the entire journey. Prices may vary, depending on the dates. There are likely other date combinations in late May and most of June that will work out to a low price. Experiment and see what's available. edmonton, yeg, flight deals, europe, western europe, paris, france, icelandair and ory. 5 Responses to "Edmonton to Paris, France - $538 CAD roundtrip including taxes | June 2016"
Thanks Chris, great find! Do you know if there is a way to find similar prices for flights the other way around (i.e. 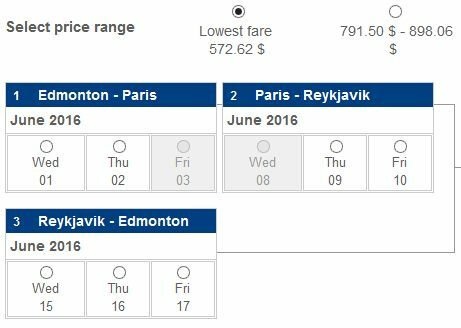 paris to edmonton and back)? Thanks Jamie! While it's usually worth checking, it's not always the case that the reverse flights have dropped. 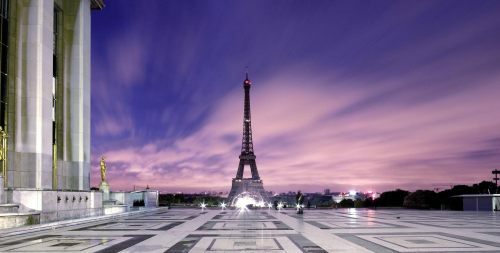 Prices are usually based heavily on supply and demand, and it could be that demand from travelers starting in Edmonton is lower than from travelers starting in Paris. But it's pretty easy to check, just try searching in reverse and see what comes up. Ok, makes sense. I'll do some investigation. Also, do you know of any people like you running actual flight deal websites in Europe? I am looking for ways to find deals for friends/family in the Netherlands to get them to Edmonton or anywhere somewhat close (e.g. Vancouver). I'm not coming up with the same prices. Has the cost already gone up for these dates?